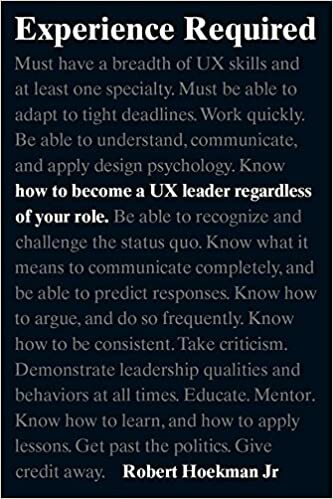 Your first book towards a designer career and constant reminder of any career, because, seriously, you don’t get such sobering insights and decent advice very often in life or career. Here’s the book I wish I had read before I had anything to do with design. And here’s the book I wish I could have written. So now it’s easier for me – I simply recommend this book as a must-read to anyone in need. How’s the book so good? Well, it’s complicated. Let’s look at the pros and cons first. Kind of a ‘personal reflection’ narrative. Not that it’s bad, but wouldn’t it be even better if the wisdom bits could be somehow highlighted or emphasized. Personal anecdotes are not worth a second read, but those hard-earned lessons, bitter truths and insightful wisdom are worth a thousand reads – they should stand out. So maybe that’s an editing/layout issue. The target audience, as the author emphasizes more than once, include not just designers (and indeed so), but the narration is towards a designer. You might get a feeling like “what? you’re talking to me? but I’m not a designer! you’re supposed to talk to me also, right?” if you’re not strictly a designer. Well I guess the author has to assume something in order to say things out, otherwise it’d be too verbose to address every single type of audience. So maybe it’s better not to emphasize too much about “this is also a book for you and you and you”, just say non-designers can also benefit greatly (which is true). Chapter 1 ‘Introduction’ makes some bold assumptions to establish a common ground for further discussion. You don’t have to agree with the author’s definitions, while those are very good ones that can help you understand. Chapter 2 ‘The Shape of a Great Designer’, my favorite, clarifies the problem of job titles and explores various implications of the practice of design. That’s critical for both designers and people who work with them. The fundamental expectations for both are set here. Chapter 3 ‘Adapting’ breaks the myths of design process and design time. The insights can help you tell decent designers from indecent ones – to me that’s very very important to human resource and management. Chapter 4 ‘Understanding’ explores the ‘user’ side. Empathy. Psychology. Yes, important – but the next chapter is even better. Chapter 5 ‘Questioning’ is another gem. Mastering the art of asking questions is probably the most important starting point of anything. And if you survey the literature of business success, innovation, design thinking, whatever, you name it, you’d find the same thing: start by asking questions; learn to listen well; question the problem first – or in the words of Kees Dorst in his amazing book Frame Innovation (read my review here), it’s about “attacking the context”. Chapter 6 ‘Communicating’ continues the broader exploration of basic skills. The notion that a designer must be great at communicating is not new, while it’s that important to repeat in any book. Chapter 7 ‘Arguing’ reads more like a sequel to ‘Questioning’. I feel like it’s less about arguing than about probing and influencing. Chapter 8 ‘Leading’ and Chapter 9 ‘Learning’ concern issues in work habit, work culture, career development and self management. Big topics, therefore more ambiguities. Not bad, while there are definitely better books on those stuff. Chapter 10 ‘Being Unreasonable’ is a total disappoint to me. The author tries to say something about the importance of ‘high standards’, which I totally agree, while the short treatment is far from convincing. Holding high standards is not easy. There are risks and sacrifices that go along with it. It’s hard to see how the chapter could help a wannabe designer. If you’re a veteran designer, the book would be a real quick read. You may already know many of the things the author points out. There could be many resonant quotable stuff. Once in a while, there are insights you haven’t explicitly realized. If you’re a beginner level designer, or you’re on the way to be a designer, this is a serious must-read for you. There might be things you don’t fully agree or understand. That’s fine. While it’s okay to disagree, you will definitely understand later in your career. If you’re not strictly a designer, everything still makes sense as long as you work with, hire or manage designers. I mean who doesn’t nowadays? You need to understand what design is about. More practically, you need to know what to expect from a decent designer, and how to work with them. And, profoundly, you need to apply the same skills a designer has, whether you believe in design thinking or not. That’s not not because designer skills are special, it’s just that those skills are mostly universal. You may want to read the book along with Kees Dorst’s Understanding Design, which, from a another angle, also provides deep insights you can’t get anywhere else.